Do you wish to inform your costumers about the SmartShare products on your own website, or send them information by mail or via hand-outs? Please fel free to distribute the SmartShare information you find on this page. If you can not find the information you need on this page, you are always welcome to contact our support on [email protected]. SmartShare StraightShaper 4000 Satellite is designed specifically for network with satellite based internet connection. It optimizes your WAN with advanced bandwidth managing functionality and is easy to use. Most satellite based internet installations are challenged with a very varying bandwidth, which makes bandwidth management a very complex task. StraightShaper Satellite 4000 guarantees and makes sure at all times, that the available bandwitdh is evenly allocated between active users. 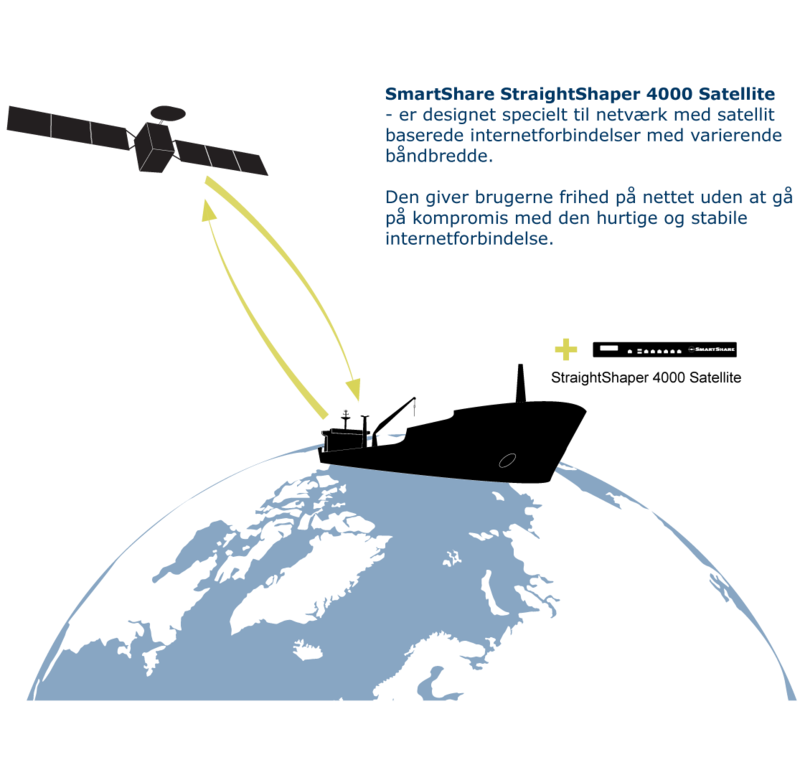 Thus it is possible to exploit the the satellite connection optimally, without compromising the users’ experiences of a good internet connection. With the integrated SmartShare Dynamic QoS™ and User Load Balancing™ developed by SmartShare Systems, users will experience trouble-free use of VoIP, video, SaaS, thin clients, cloud and centralized applications, while the ISP gets a more balanced backbone. Read more about SmartShare StraightShaper 4000 Satellite. Download product illustration of StraightShaper 4000 Satellite her. 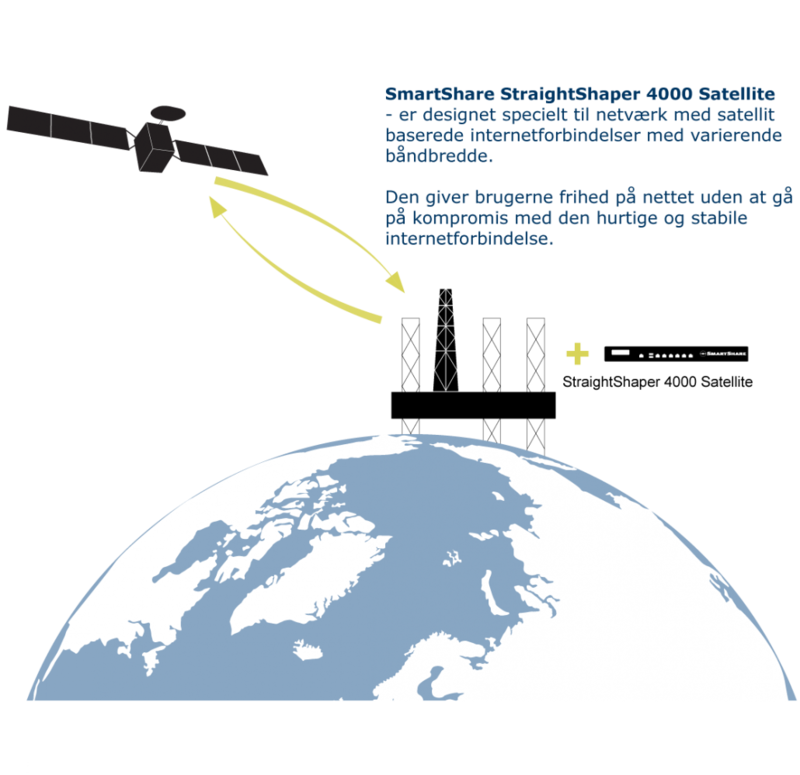 Read more about StraightShaper 4000 Satellite. Download SmartShare StraightShaper 4000 Satellite product sheet. Get the SmartShare logo in .png format here. Get the SmartShare logo in .jpg format here. The quick explanation about User Load Balancing™. SmartShare User Load Balancing™ is a patented technology which is integrated into all the SmartShare Systems’ products. The technology identifies the number of users and their behaviour and automatically allocates the available bandwidth so all users experience optimal internet speed. Imagine a round-about that makes traffic proceed smoothly without queues or delays. That is the philosophy behind User Load Balancing™. Read more about User Load Balancing. The quick explanation about SmartShares Dynamic QoS™. Dynamic Quality of Service™ is a technology patented by SmartShare and integrated into all SmartShare Systems’ products. This technology analyzes traffic patterns and automatically prioritizes time-sensitive traffic such as IP telephony, video conferencing and thin clients, so that they operate flawlessly and without delays. The traffic analysis takes place continuously, and the prioritization and allocation of extra bandwidth happens in a fraction of a second. As the technology is an integral part of the bandwidth optimization function, there is no need for configuration or manual allocation of bandwidth for connections.